The fall fashion season is just about to begin, and fine-tuning or beginning to curate your own capsule wardrobe is a wonderful way of welcoming the season as a means to simplify your everyday routine, bolster your confidence and in the long run, save your pennies. Invited to share details on how to curate your own Capsule Wardrobe, I brought my own (yep, those are my clothes you will see in the segment – yikes!) fall capsule wardrobe. During our conversation you will learn the components of what a capsule wardrobe entails, examples from my own wardrobe as to how to mix and match as well as why “cost per wear” is a worthwhile idea to embrace. Much more is discussed in our 7-minute segment, and for the in-depth post which inspired the segment, click here. As well, shop TSLL Capsule Wardrobe Boutique where I hand-select classic, quality items for your fall and spring capsule. Be sure to stop by September 1st when this fall season’s Style Shopping Guide will be posted in which I navigate the trends of the season, sharing which to splurge and which to save on (see Spring 2017 here). One tool I want to make sure to share with you is the bookmarklet Shoptagr. If you are looking for a way to know when your favorite items receive a price drop the moment it happens so you can take advantage of the savings AND purchase something you love, you will want to upload Shoptagr to your browser (it’s free). All that you need to do while shopping on just about any website is click on the “S” that will show up on the right-hand side of your computer screen, click save and then when the price drops, you will receive an email and link to the product to purchase should you choose. Sometimes it takes months, sometimes it takes days, but it is a time saver (the silk navy shirt I am wearing in the segment from Malene Birger was purchased at a discount upon being alerted by Shoptagr that the price had dropped). I just watched both your tv segments and really enjoyed them! You have so much useful information to offer. I’ve also started doing something rather luxurious, (late to the party, I know), but I’ve started listening to your podcasts in the car, rather than the radio. I love them! It’s really these little luxuries that add up to a feeling of wellbeing. Paula, Thank you for tuning in and for stopping by to check out the segments. 🙂 I couldn’t agree more. It is the little everyday things we do that make a grand difference. That was great Shannon! I have to tell you my Mom doesn’t watch “AM Northwest” it’s just known as “Helen” in our family. Great segment, fantastic info! Wonderful segment and perfect timing as a new season is on the way! Time to purge and refresh the capsule. This is the first time I am writing to you. I am French and live in Germany. I have read your book a few times already and also am always looking forward to your daily/weekly podcasts / comments. Great job! Thank you for saying hello Anne! 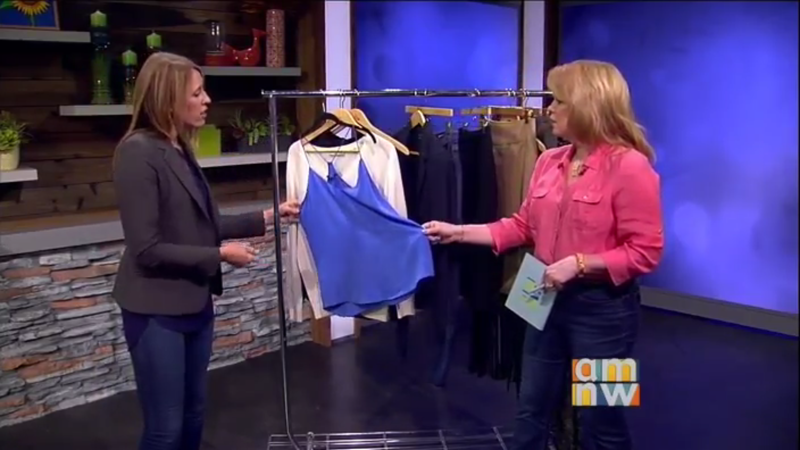 This is a great segment Shannon, so looking forward to your fall Shopping Guide! Thanks so much for the video clip. Since I first heard the term “capsule wardrobe,” I’ve been trying to curate my wardrobe to that point, but I’ve had limited success. It was helpful to see the items you’ve chosen along with an explanation as to why. Also, I want to complement you on being so articulate in that segment despite the stress of having to impart lots of information in a short amount of time. It’s refreshing to hear someone speak eloquently, avoiding the annoying “upspeak” that’s become so common these days.